Mitchell Duke (Mitchell Thomas Duke) is your tough through and through Ozzie who is nonetheless a very loveable chap with an eternal smile. True to say he has apparently lost some of his Australian drawl thanks to his lovely English wife, Charlotte, who keeps strong ties with her country where their son, Jaxson, was born. Mitchell, one son with 6 sisters and 2 brothers of Arlene and Bill Duke, traces back his origins, five generations back, to Scotland and Ireland. Although he has gone through harrowing times after a practice in January last year when he badly damaged the anterior cruciate ligament of his left knee (his kicking leg, although he can shoot with both), fortunately repaired by a famous surgeon back in Australia, he is extremely positive about life in Japan, and Shizuoka for that matter, a country blessed with a rare safety, reliable hygiene and unequaled service. To top it all he is still discovering the culinary joys of Shizuoka City and Prefecture, actually helping him cut the excess food, red meat in particular, and in the bargain easily control his weight, a major concern for any professional athlete. When asked to cite a negative aspect of his life in Japan he could not think of one. He went as as far as averring that many of his foreign colleagues in soccer were persuaded that Shizuoka Prefeture was the most propitious place to ply their trade hanks to a neutral climate and a mild winter. his favorite food in Australai was basically BBQ-style, but he learned to appreciate lighter fare in Japan, sushi and Italian cuisines in particular. Incidentally his favorite (at present) diners are Massimo in Miho, Shimizu Ku, shizuoka City and Gyoko Fuku Ichi Maru Sushi restaurant at Markis department Store in Shizuoka City. He was also very complimentary with Tequila’s Diner and Blue Books Cafe in Aoi Ku, Shizuoka City and he cannot wait to discover Aoi Beer Stand! But the best chance to meet him in person would be at one of the HUG COFFEE shops whose coffee he rates as the best in town. During his free time he enjoys going out for lunch with Charlotte and Jaxson and shopping for great produce in local markets. His wife in particular feels a great attraction to local vegetables which can be acquired all year round as Shizuoka Prefecture is renown for its incredible array of organic products. Mind you, on game days it’s plenty of carbohydrates for Mitchell’s lunch! This was my first interview held at Shimizu S-Pulse club house in Miho, Shimizu Ku, and it actually turned into double one as we met shortly after downtown to sip coffee together with wife and a very busy body Jaxson. Q: Have your tried your hand (or foot) at other sports? A: I did play cricket but at the early age of 13 I had to make a decision and it was soccer from then on although my own father was very much into cricket, the top summer sport in Australia. Q: How has you rehabilitation gone? A: I’m now fully recovered thanks to the best surgeon in Australia. Actually his methods of operation are completely different from those in Japan. Instead of concentrating on the knee only he will go down as far as the calf muscles and tendons for a full repair job. Back on my feet after 5 months, a comparatively short time after such an injury! Q:: You were still recently hampered by a pulled muscle , but that also seemed to be cared for. When do you ex@ect to play as a starting team member after this recent series of substitute appearances? A: It should be very soon indeed and I’m giving my best to prove my worth at practice. Q: Are you looking forward to playing again for the Socceroos (Australia National Soccer Team)? A: Honestly speaking, I’m always looking forward to that day in spite of the long break. Now is in fact a good time to remind the selectors and my skills. It is up to me to prove I have the will and talent to represent my country, the ultimate goal for any athlete! Well, that’s it for the moment gals and guys, but I convinced Mitchell to meet me again soon around a drink (it will be an embarrassment of choice, but I ave an inkling of what would be the first place!) and talk more about soccer at Shimizu S-Pulse, in Japan and in Australia! In August 2013 had a two-week trial with English Premier League side West ham United. Hello Mitchell! Former Central Coast player that until now I had not heard about for a while. 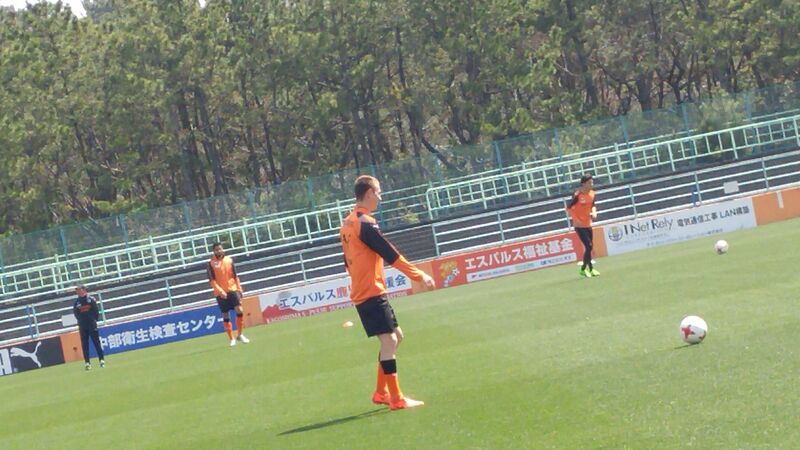 Nice to see him happy and doing well at Shimizu. My brother and his family are Central Coast fans. 4 of my family travelled to Nagoya in June 2012 to watch Central Coast play Grampus 8 in the Asian Champions League. I think Mitch might have played? My daughter and nephew went back with the Central Mariners team to their hotel after the game. My brother and I stayed at the izakaya. What a night! To give a Shizuoka connection, our group stayed a couple of nights at Ito before heading to Nagoya.